In a new book, channel veteran Mark Smith makes the case for business change—and how nimble MSPs can reposition themselves for long-term success. You’ve heard it a thousand times: you must change your business in order thrive in the new era of digital transformation. Longtime channel veteran and business consultant Mark S.A. Smith has just published a new book that explains why. 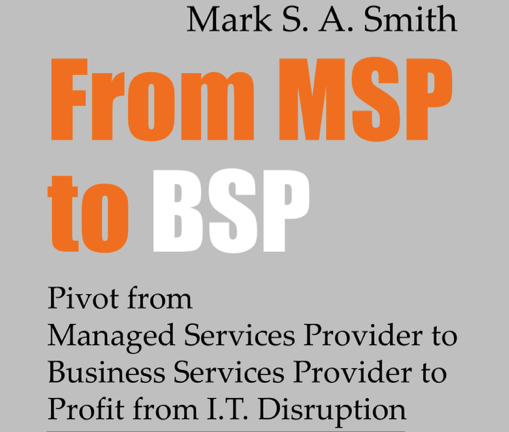 In “From MSP to BSP, Pivot from Managed Services Provider to Business Services Provider to Profit from I.T. Disruption,” Smith makes the case that forces bigger than any one company will compel channel leaders to rethink their entire approach to selling technology products and services. While some of Smith’s conclusions are not new—just this week Ron Coughlin, president of HP Inc.’s global Personal systems business, shared some similar ideas at the fall Varnex event hosted by Synnex—Smith presents his theories in terms that channel practitioners will intuitively understand. Take his view of data center consolidation. “How can you be a managed services provider when there will be nothing left in the data center to manage?” he wonders. To Smith, the need to change is obvious—if not inevitable. Only one of the 12 companies that comprised the original Dow Jones Industrial Average from 1896 remains today. That company, by the way, is GE, which is undergoing a dramatic transformation of its own. Churn, Smith adds, is natural. But it is occurring a much faster pace than before. What we generally assume to be careful wisdom practiced by leading economic titans is actually fatigue or uncertainty about what to do next. Why the anxiety? It’s because many of the fundamental laws of business as we’ve known them are being re-written. Work, for example, is no longer a place you go, but a thing you do—everywhere. Ownership of capital-intensive assets, likewise, is no longer a requisite or even a priority for many businesses thanks to new thinking pioneered by Uber, Airbnb and Netflix. What are the implications for MSPs? “You should be a little bit scared,” he says, if you sell basic break/fix support services that will soon be more efficiently provided by AI-enabled machines. Likewise, you should be worried if you sell to data center customers whose own executives wonder how much longer they will need to own such assets. And you should question your business model if it revolves around selling customers five-year’s worth of technological capacity at a premium when asset depreciation, technological obsolescence and disruptive innovation have never been so pervasive. As with the original Dow Jones 12, the broad macro-economic, demographic and technological changes afoot will threaten big companies with dated business models and give rise to more nimble and agile companies that understand what a new generation of tech-savvy, consumer-oriented and results-focused customers want. “If this makes you feel that you have a gun to your head, then it’s time to sell your practice. But if you are energized and excited about what’s ahead, they you have plenty of reasons to be optimistic,” Smith says. Take AI, for example. While it will undoubtedly upend those who rely on basic brake-fix services to make their income, the market is expected to grow from $5 billion in 2016 to more than $160 billion by 2020. Instead of looking at AI as a threat, see it is an immense opportunity, says Smith. And that’s just the beginning. The future belongs to those who can deliver value above the first few tiers of the common seven-layer technology model. Tomorrow’s solution providers will help customers identify new business models, implement new business rules, amplify the acumen of their teams through education and create new experiences for their customers through the delivery of advanced digital services. Rather than sell technology that makes business processes more rigid, complex or inflexible, sell technology that helps makes business processes more frictionless, Smith advises. This requires adopting a different mindset. Rather than ask yourself how you can beat your competitors, “the question you should be asking is ‘how do I help my customers beat their competition?’” Smith says. This will require MSPs and ICT consultants to elevate the value they deliver. For more on how, check out Smith’s book, which you can find here. It’s free and highly recommended. You may not agree with everything Smith says. But you’ll be challenged to see things differently, much as you were when former Gartner analyst and current Salesforce customer evangelist Tiffani Bova said “fire your salesforce,” or when Jay McBain of Forrester called upon the industry to embrace alternative and specialized channels. Let me know what you think: Thomas.doyle@informa.com.